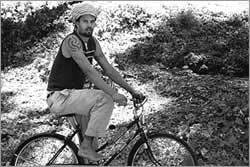 Pushing boundaries, musically, lyrically, and socially, Michael Franti has been an artist of conscience who with the power of his group Spearhead has continued to challenge himself and his audience to seek fresh perspectives on our ever changing planet. Exploring new ideas, the music of Spearhead has a soulful personality with a provocative voice and style that breaks fresh ground in black music. The band's 1994 Capitol Records release debut disc,entitled Home, received critical acclaim for ist unique blend of rap, reggae, soul and mixed with equal parts of social and political consciousness. Franti (in his tenth year of touring and recording) is a poet, a onetime college basketballer and a former member of The Beatnigs, as well as the aggressive rap group Disposable Heroes of Hiphoprisy. A six-foot-six Bay Area resident, Franti's smooth rap flow leads the Spearhead crew, which includes vocalist Trinna Simmons, Rasta chanter Ras I Zulu, drummer James Gray, guitarist David James, Carl Young (who has now moved from bass to keyboards) and new vocalist and bassist Oneida James. Spearhead's debut LP Home spawned such jazzy, soulful singles as "People In the Middle," MTV Buzz Bin favorite and CLIO winner "Hole In the Bucket" and the ground-breaking track "Positive," which also appeared on the LP Stolen Moments: Red Hot &amp; Cool, the first project from the hip hop community dealing with the subject of AIDS. Stolen Moments…was also voted Time magazine's Record of the Year in 1994. The track "Positive" and ist music video deal with the anxiety surrounding the decision to get tested for HIV. "It's better to know than to not know," says Franti in "Positive," a message the African American HIV/AIDS Program of the Red Cross (in collaboration with Capitol Records and Spearhead) have chosen as the centerpiece for their teen outreach efforts in 1996. The video has been distributed to their Statewide HIV/AIDS networks and over 700 local youth groups and detention centers are currently using the video with much success. 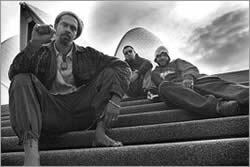 Their second release, due out in 1997, is entitled Chocolate Supa Highway and is described by Franti as "the other side of the information super highway. The Black realm. The way we as black people communicate…through music, voice, ideas, and that comes from a shared history of battling to retain our way of living in the face of colonialism…hip hop is our world wide internet. The album is about inspiration, not information. Most of the stories on the record come from my experiences of traveling around the world on tour and seeing the global warmth hip hop has spread. It's time to recount the events of the last century and begin to hold accountable, the fraternity of good ol' boys, coke smugglin' politricksters, and well-dressed slime balls, for the misdeeds they have perpetrated upon "Us", the dependable, good natured, herb using, hip hop generation." Chocolate Supa Highway is a stronger, more aggressive collection than Spearhead's debut. "The new album takes a broad perspective on music and the world without losing the essence of the streets, where music lives. The songs were given birth in our camp's new compound, Blak Militia studio, which serves not only as a sweaty work space, but a meeting place for like minded artists, Rastas, Roots rebels, and hip hop revolutionaries from all around the Bay Area. The combination of all the people who chill and vibe at the studio creates a sauce which is the flavor of this album. Hot Chocolate Sauce that is." Michael has been busy producing many new projects and remixes, including new rapper Ismail El A.K.A. The Invisible Man, and a solo album for Spearhead's rapturous vocalist Trinna Simmons. Spearhead has recently completed 35 U.S. dates on The House of Blues' Smokin' Grooves tour with the likes of The Fugees, Cypress Hill, Tribe Called Quest, Busta Rhymes and Ziggy Marley and the Melody Makers. As a result of the camaraderie spawned with Ziggy's younger brother Stephen Marley, a secret collaborative recording took place in Spearhead's Blak Militia studio. The single (3 O'Clock Roadblock) will be released first in Jamaica and then featured as a track on Spearhead's new album.Get ready for your journey down the Chocolate Supa Highway with Spearhead to once again explore what URB Magazine described as "a sense of balance between thought and rhythm, intellect and grooves"